This little goldfinch landed in my backyard one morning this past spring. He sat on a rock near the birdbath outside my kitchen window. He was so brightly feathered he looked like an Easter egg nestled there. I wanted to capture the image but with only a very limited telephoto lens I felt sure it was impossible. He would fly away before I could get anywhere near him. So I just looked out at his bright form and smiled. I kept thinking he would fly on. He didn't. Instead the little bird just sat there. Finally I had to go closer to see what was going on. But, sure enough, as I approached he did fly away. The thing is, he didn't get very far. Something was wrong. He flew a few yards toward the backyard fountain and then just lay in the foliage there, with one wing oddly extended. I am no great expert on wildlife and I didn't know how to help. I moved closer to see if anything was obviously the matter. When I didn't see any noticeable injury I decided to go ahead and take pictures. At least my proximity would keep any neighborhood cats from taking advantage of the situation. I was very close to the bird now and didn't even need a telephoto lens. Soon the little bird seemed better. He arranged himself there on a rock and tucked his wings neatly around himself as we both listened to the sound of the water in the fountain. After I finished with my camera I began to do some yard work nearby. Before long I turned to find he had flown away. This was a rare opportunity to capture the image of a wild bird up close with my little camera. 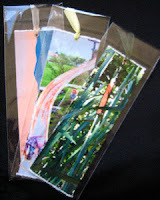 I was very pleased with the images that resulted. 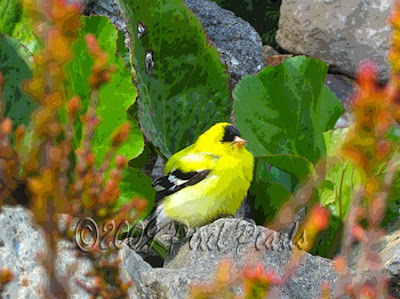 I made some simple adjustments and filtered them to simplify the details of the background and to highlight the splash of wonder that the little goldfinch brought to my day as he rested near the fountain in my backyard. This image was captured on a beautiful afternoon in Murten, Switzerland, just outside the town walls. We walked through this wonderfully haphazard garden growing roses and sunflowers as it trailed seedpods and morning glories along the stone walls. In the background the bastion of the wall can be seen. In the foreground a bumble bee is oblivious to the historic setting. Intent on its work it is drenched in pollen from top to tail as it hangs heavily in the air approaching a bright sunflower again and again. This bee amazed me. 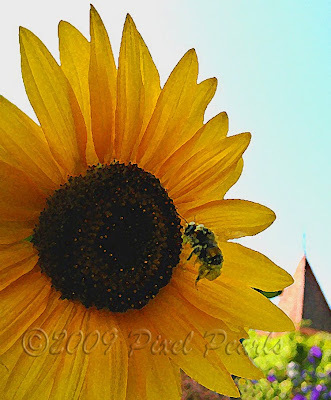 I was able to capture his image as he hung in midair serenading the sunflower but it was a challenge to capture the weight of his pollen laden body and to convey the slow determined persistence of his flight as he courted that huge blossom. Try as I might, my own persistence in courting this image has yielded only a mediocre result. I like the image, the brightness of the flower, the interesting but receding background, the texture of the bees cargo and the profusion of the surrounding garden but I never felt that I was able to capture the story I witnessed as that heavily burdened little bee pursued his passion in a cottage garden by the old town wall.